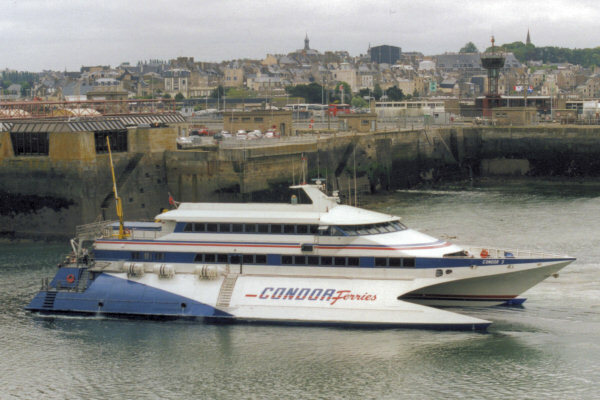 Condor 9 was a fast passengers only ferry managed by Condor Ferries and used on the Channel Islands service. She was replaced in March 2002 by the Condor 10. Condor 9 was built for Condor Ferries in Fareham by Aluminium Shipbuilders. 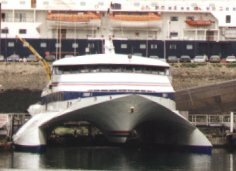 She entered service with Condor in August 1990 on Weymouth-Jersey-Guernsey services. She continued on this service until 1993 when she was replaced by the car-carrying Condor 10. During the summer of 1994, Condor 9 was chartered to Viking Line for Helsinki-Tallinn services as Viking Express, followed by a winter charter in the Caribbean. In 1995, she ran some trips from Torquay, whilst in 1997, Poole was used as the UK mainland port. In 2002, Condor 9 was sold to Stetson Navigation as the Cortez, and used between La Paz and Topolobampo across the Gulf of California (Sea of Cortez) in Mexico. The service started in May 2002, and operated for about a year, until halted by engine problems. In 2004, Cortez was sold to Wronowski in the USA, as Jessica W. After August 2004, she runs for Cross Sound Ferry on New London, CT to Block Island route in summer and on Orient Pt. to New London route in winter. In 2007, she continues on the service to Block Island for Block Island Ferry Service.